TLJ is full of subtle (and some not so subtle) sexual images - Rian was a naughty boy! last jedi comic adaptation 5 of 6 preview..
rofl - check out the blood spurting everywhere haaaa!!! totally not possible with a lightsaber but because it's Snoke I love it haaa. I must be a bit twisted.. the first thing I noticed is that this artwork kept Snoke's hands attached to his arms. I noticed because in the movie Snoke basically got the skywalker special - and I loved this little touch! haaaa! Rofl at the massive fingers in the foreground haaaa.. I'm sure you will not be alone in that gutter rey09! Thanks for sharing this! this comic has snuck up on me I've been so busy in RL. Looks like issue 5 of the comic adaptation is released 1 August.. very soon! Here's a preview of the issue if anyone wants a sneak peek! So far it seems to stick very closely to the movie, but some of the artistic choices are super interesting in terms of what is being emphasised. 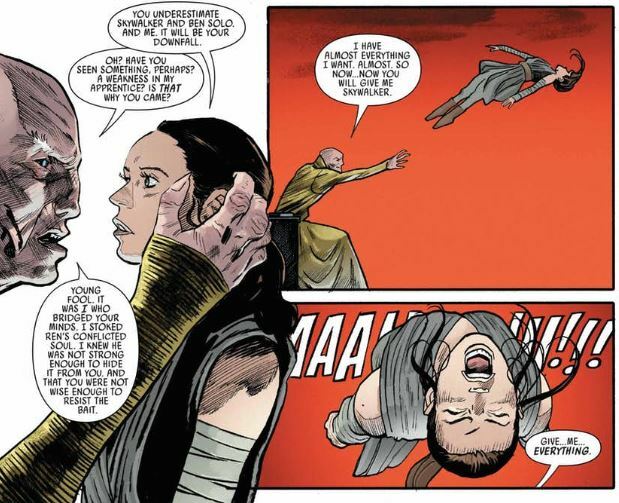 I'm liking the emphasis on how brutal Snoke was with Rey - this doesn't get acknowledged enough! -rofl. Rian is a genius! hi Everyone, just thought I'd give a shout out to some new series which are being published on starwars.com - good, thoughtful topics digging deeper into characters, connections, themes etc. - cool.. Rey's connection to Ezra- I had never thought about it!! Enjoy! @DeeBee wrote: hi Everyone, just thought I'd give a shout out to some new series which are being published on starwars.com - good, thoughtful topics digging deeper into characters, connections, themes etc. The in-depth essays are fascinating, yet I noticed that they are composed by collaborators (people outside LF). My fingers are crossed that what on paper, which seems to be a good idea, does not become a mess because of the opposing viewpoints of the SW mythos, and specific characters (i.e. Ben Solo/Kylo Ren). For example, in the Rey/Ezra essay "Kylo’s emotional connection with Rey revealed that he only wanted the girl from Jakku to serve as his partner in a bid to rule the galaxy." and "She is now the last of the Jedi and must complete her training — and confront Kylo Ren — on her own." To be fair, both statements can be read in a neutral stance, or misdirection stance, yet considering authorgate...I feel dread. lol Anyway, I hope starwars.com asks known Reylo meta writer to contribute, as well. And if they already have - wonderful! Indeed!- I view them as think pieces only - not facts being presented from an authority, even if it is published on starwars.com. I don't think different viewpoints will influence star wars. The stories are finalised years ago, and the speculation/different viewpoints on a yet to be completed story are all part of the story unfolding.. for me, I don't worry about this..
Yeah I noticed that Kylo reference you quoted from Neil Kleid too - I figure it is referring to a particular point he was trying to make when comparing Ezra and Rey - but, for me, the 'only' in the sentence tips this over into 'I don't agree' territory. It's not the only reason. Without the 'only' I would read it as neutral. but that's okay he can have an opinion - we don't have the full story yet, and we certainly have been kept in the dark at this point about kylo's motivations (these star wars writers are also in the dark). 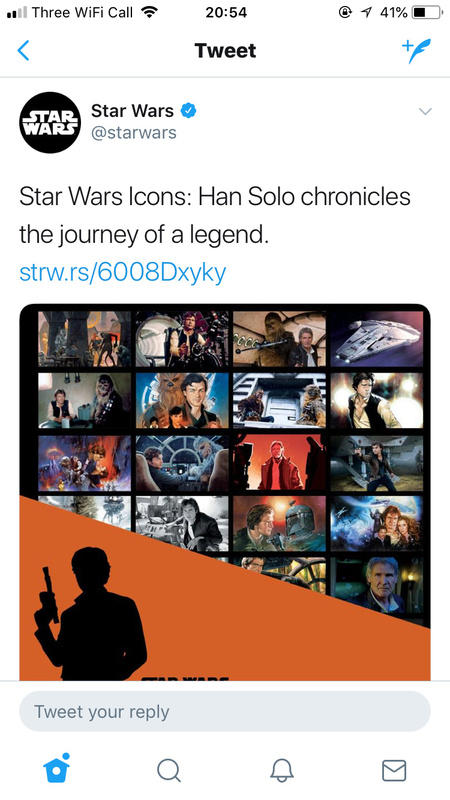 I find the star wars articles generally avoid extreme and inflammatory language, and are overall thoughtful and worth considering - even if I don't always agree. I share your hope for reylo meta writers to be published on starwars.com - but, I suspect we won't see anything like that till after IX is released. I think when the talented reylo meta writers IMHO join the dots the ending of IX becomes too obvious. LOL! Gotta keep that mystery and suspense alive and all that haaaaa..
bottom line for me is: just give me reylo happy ending in IX and I won't have to have any starwars.com articles discussing it haaaaa! Anyway, I only feel worry because of the drama it creates. There is enough drama on the outside, so if it is caused from actions of LF, or connected to LF due to contracts, etc...I just....sigh. So, my fingers are crossed, and that indeed - excellent Reylo meta authors are given the reins when IX premieres. For me, I just figure - it's more enjoyable to not worry Star Wars is for enjoyment.. as you say, real life has enough worries of it's own - I've chosen not to attend to the drama. There is way too much positive star wars stuff for me to soak up and enjoy, I just don't have the space for drama - whooo hooo!! I'm glad together we can keep the joy alive! Reylo meta authors definitely do that too!! Oh hey SW_Heroine_Journey, I hope you enjoyed the Thrawn Alliances book! Are you finished? I haven't progressed much so far - I'm reading the aftermath trilogy.. [just finished the 2nd and am just starting the third], then I'll get on to Thrawn. [I've stopped going in that thread now till I've read it lol] However - I did watch the first issue of the Thrawn comic voice dubbed on youtube. Whoa!!!! I can totally see why Thrawn is so fascinating and well loved!!!! Hi all! 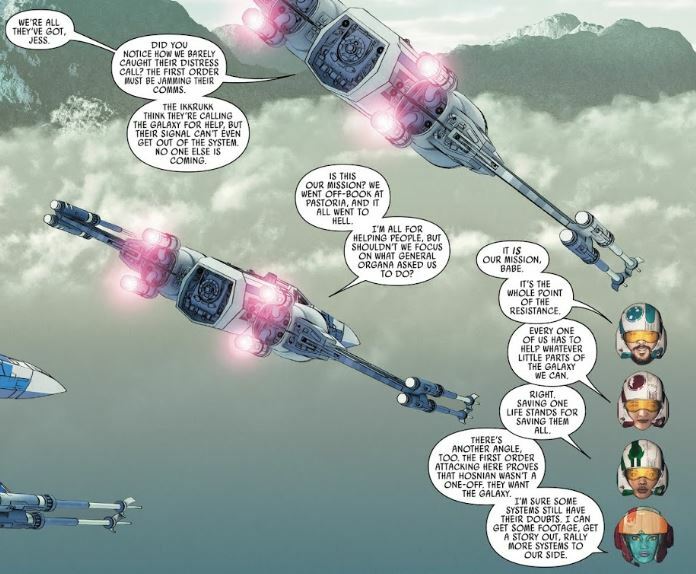 Poe Dameron #30 is released 15 August.. and I've just come across a preview.. 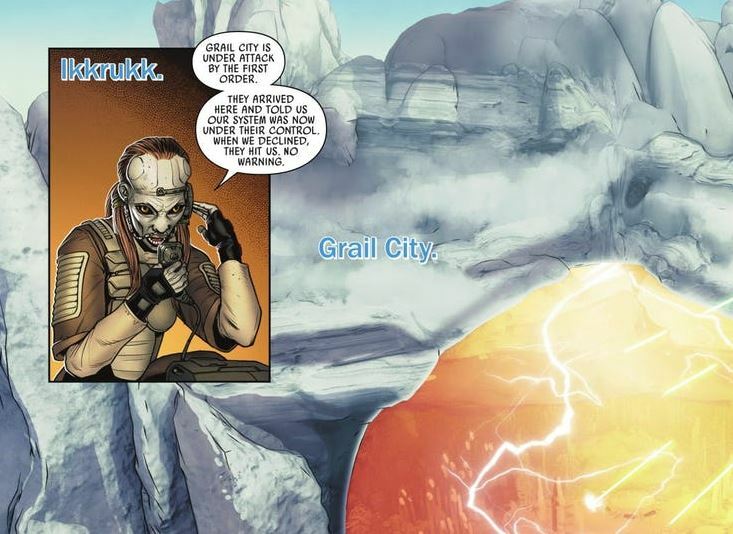 Seems we have a new planet (Ikkrukk) and city (Grail City) that have been introduced to canon. The planet is in the mid rim. Another new tidbit, seems Leia had alist of potential allies that she provided. I hadn't heard that confirmed before but I figure it was implied..
Looks like during the events of TLJ - the First order is busy trying to invade Ikkrukk - and black squadron pick up their distress signal. would you like to see Ikkrukk in IX? how about that nasal finery all?! I am indeed finished! It actually causes me to wonder if 1) We received a hint about the bad guys (or one of them) in IX and 2) In the end, Thrawn will also be redeemed, be a grey character once the cartoons conclude with his character (he may appear in Resistance), or with comics. @SW_Heroine_Journey - I would love for Thrawn to be redeemed too. lol. I don't even know him very well but I love this aspect of Star Wars and want to see every character redeemed (okay except for Palps and Snoke!). Hi all, this is interesting - I posted this under the Solo film thread too. So a military tribunal- I wonder if this was originally a scene in the film ? If so I wonder if they deleted it because we are gonna see a military tribunal in episode 9????!! I vaguely remember reading they deleted it because it was slowing the movie and not really essential. On another subject, I read the One shot on Beckett. There was nothing important happening but I was happy to meet him and his band again. There was a cool ship, the Rampart (an easter egg to a movie of Woody Harrelson) and I liked seeing Enfys. But there was again a tentacle monster. One day i'm going have had enough and make a comprehensive list of every tentacle monster in all Star Wars media since the reboot. I'm starting to think someone at the top of disney has a fetish or there is an alien race of tentacle monsters trying to take control of the Galaxy. Don't be fooled, TLJ wasn't divisive because of Luke or the Resistance plot, it was the lack of tentacle monster! Hiya! Just thought I’d share my take on two SW comics released this week.. Poe Dameron #30 and Beckett #1. I’d love to hear what others think about them! At first this issue felt a bit meh. But now I’m pulling together what’s new from it, and wondering what is going to be relevant to IX, it’s more interesting! We have Poe on the MF again watching a message from Jess Pava. The message ends, and then the comic ends with a second message from Jess Pava. We had black squadron visiting a new city/planet: Grail City/Ikkrukk. I think we got a reminder/ clarification of what the resistance is all about.. what is it’s mission. The idea about the FO jamming the distress calls - could explain why no one responded to Leia's distress calls sent from Crait. This idea about documenting and getting the information out there to others so they can see what the FO is doing, may be a hint of what is ahead for the resistance. Could be a thread picked up in IX. Interesting artwork here, I like it. Interesting that Ikkrukk was heavily defended, but it was infiltrated by FO sympathisers who were able to shut down some of the defences.. Hmmm people working on the inside – this seems to come up time and again! Is it just me or do these FO sympathisers have their own flag? Their own version of a FO flag? Jess is able to get Ikkrukk’s defences back up and running, if she can get into the control room…. So the squad aims to get Jessica into the city… Suralinda accompanies her as back up, Snap and Kare stay outside fighting the FO. Jess damages her ship getting down to the people.. and the message ends. Poe starts watching the next message – and we find that things have gone really badly – we only see the start of the next message – which I guess the final issue #31 will cover. Jess is in big trouble.. and it looks like Suralinda is dead, a big wound in the middle of her chest... Boooooo I was hoping we’d see her in IX. We got new content about the FO too.. but I think I might actually share that over on the Episode IX First order thread rather than here. Hope that's okay. -rofl! yeah good call! I wonder if the tentacle monster is trying to appeal to overseas cultures who like tentacle monsters- Japanese culture enjoys them don't they? maybe? I don't know- bet someone here knows more about this than me! I found the style interesting – they were certainly going with the cowboy theme! Beckett, Val and Rio Durant are just not interesting to me.. but I like to see if there is anything new, and I wanted to see what happened with Enfys Nest! The gang are on a job – to steal blank ID chips from someone named ‘Dvorad’. 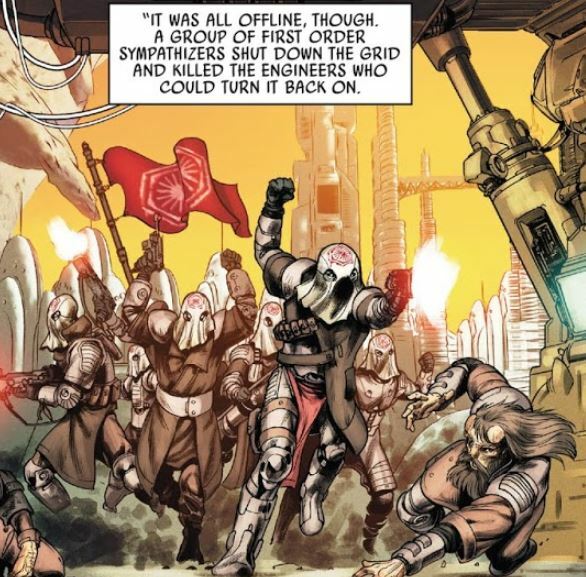 They think they are working for Vos, but in the end, it turns out they are actually working for Enfys Nest who tricked them into doing the job. We have a new card game: Neerok, which is described as similar to Sabacc. The concept around their trick at the card game is interesting – Beckett plays on their ‘crazy old superstitions’ posing as a ‘Death Priest’. Which we learn is a ‘legend’ that ‘comes up from the depths’, and is ‘an evil wizard’. Looks a bit Kylo like no? I find this curious, makes me wonder if this legend originated with a dark side force user of some kind..
Yeah.. tentacle monster.. a few snappy one liners from Beckett and meh. I would not spend money on this comic.. Most interesting – was when Enfys Nest shows up to reveal that it was really she they were working for… and she wants those blank ID chips. Beckett blows up the ship, and blank ID chips rather than hand them over. We see Enfys and her gang go flying.. but we don’t see what happened to them and if they survived. 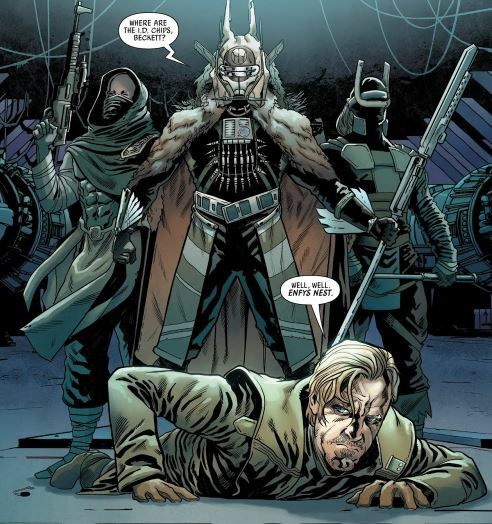 I thought this comic was going to reveal: ‘why is ENFYS NEST— one of the galaxy's most dangerous and brutal marauders — so dead set on taking him down once and for all’? I guess it’s because he tried to blow her up and the blank ID chips up? and because he is her 'competition'? Seems a bit anti-climactic. I was thinking this comic was a one shot… there isn't more story coming is there? Could be that this Enfys Nest is not the same as the one we meet in Solo – We did learn in Solo that her mother had worn the helmet before her. Maybe we saw the mother get blown up when she was Enfys Nest. I really don’t know..
Will be interesting to see what the Solo Comic Adaptation is like! Thanks for reviewing Poe's comic, I'm waiting for it to end to buy a complete edition and read it. 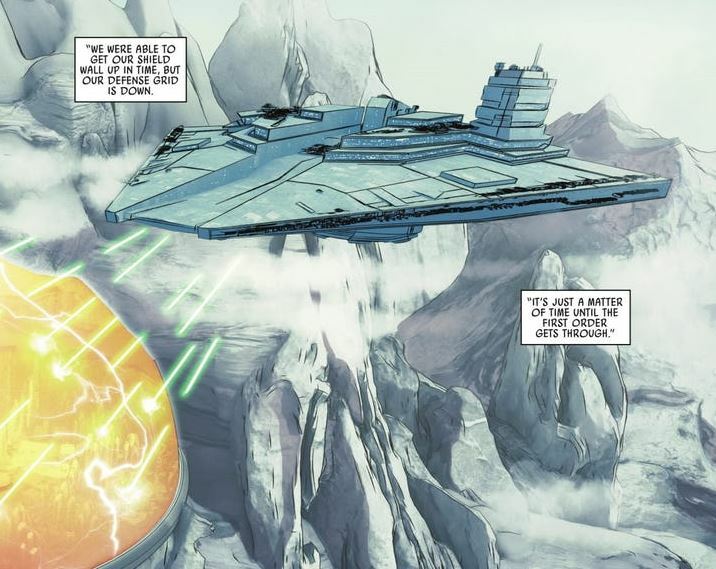 By any chance, do you know when the entire comic takes place before TFA? Apparently the Resistance serie takes place 6 months before TFA, so I'm wondering if there is going to be ties between the two media. "The idea about the FO jamming the distress calls - could explain why no one responded to Leia's distress calls sent from Crait." I think it's the explanation they're going with for Ep.IX. This way, it would be logic to have people help Leia in the next movie. The situation seems dark for Jess and her squad. 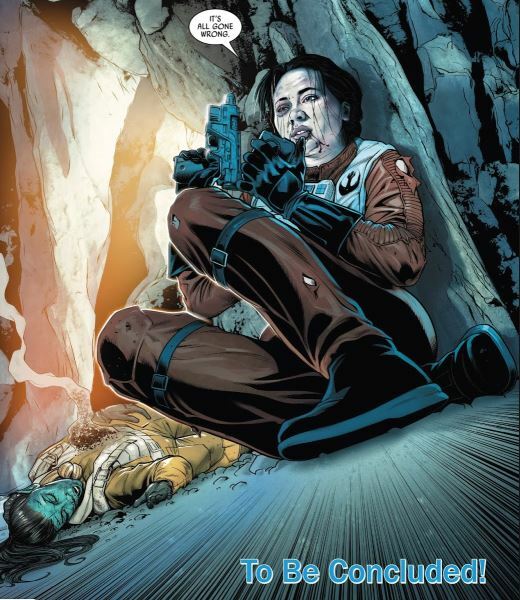 It would be sad to end the comic serie with her death but it could be a way for Lucasfilm to explain why she is not in Ep.IX (For now she was not announced in it). It could also be a good motive for Poe if he become more radical in the future. When the next issue come out, the first thing I will check will be if Jess survive. About Beckett, well, in Japan tentacle monsters are associated with a not-kid friendly trope which is now used to make jokes about Japan. I find it distracting and it deconnects me from the story. 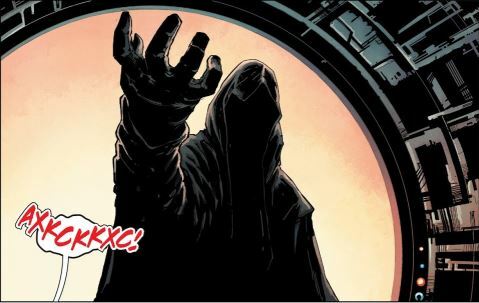 About the ‘Death Priest’, I see Darth Maul rather than Kylo (the panel remind me of another one in a Maul comic), and I believe the old legends come from Sith doing as they pleased during decades. For Enfys, I didn't think of her mother. Could be. But as they all look like as they are in Solo, I suppose this story is not long before the movie so it should be the same Enfys. I really don't know about this. It was a One-shot but maybe it's like a pilot in a TV serie. Lucasfilm wanted to see if they could make other stories about Beckett. @LadyGaufrette you're welcome! Glad you enjoyed it. I actually haven't read the whole of the Poe series. I need to go back to the beginning.. I would if I could get an electronic full version maybe. Hmm we'll see! They are great to read during a lunch break! TFA is 34 ABY too. Time lines are always tricky because lots of star wars content has multiple time lines in it. It may be resistance tv show is before the poe comics or they cross over and share some of the timeline. @DeeBee wrote: @LadyGaufrette you're welcome! Glad you enjoyed it. The timelines always confuse me too. I thought I saw someone mention that the Poe comics take place shortly before TFA so I assumed at least some months before? The Resistance show appears to take place approximately six months prior to the start of TFA, so I could see it overlapping with the Poe comic and TFA at some point if they continue with the show for a while. Seems confusing on how it’ll all work out, but we’ll see. @SW_Heroine_Journey I think most of the Poe comics are pre-TFA, but some of the more recent ones have post-TLJ stuff. They are overlapping with the ST, but the series is set to end I think next month. @californiagirl wrote: @SW_Heroine_Journey I think most of the Poe comics are pre-TFA, but some of the more recent ones have post-TLJ stuff. They are overlapping with the ST, but the series is set to end I think next month. Thank you! Also, knowing what I meant - I ditzy typed comments vs comics (now corrected). Sorry, I meant the Poe comic events began before TFA, so the oldest issues took place shortly before the ST, but as @californiagirl specified, the more recent issues now taking place post TLJ. But I'm surprised, it looked like a lot of things was happening to Poe in the comics but it only took place shortly before TFA. And this Galactic Standard Calendar is really something (one week = 5 days, where is my weekend?!). Time in Star Wars always makes me laught, because it looks like everyone age the same way, but in the real world time passes differently if you are near the center of the Galaxy or to the edge. Thanksfully we use the Star Wars physics laws. To be more specific, issues 1 to 25 are before TFA and issues 26 to 31 are after TLJ with Poe telling what happened to him during TFA and learning what happened to his squadron during TLJ. 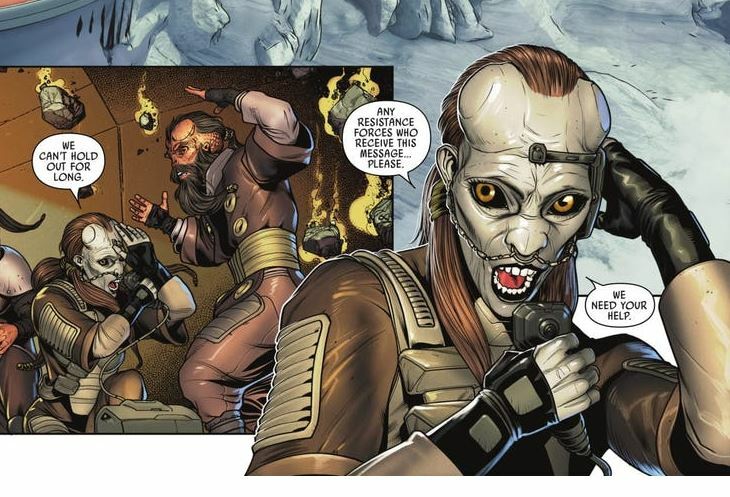 Preview for the Poe comic Annual 2 was released, and I'm laughting, not because of the drawings, but because my very first thought was 'Oh look, they gave Leia the same hair color than Kylo'. New Han Solo book coming out in a few months. 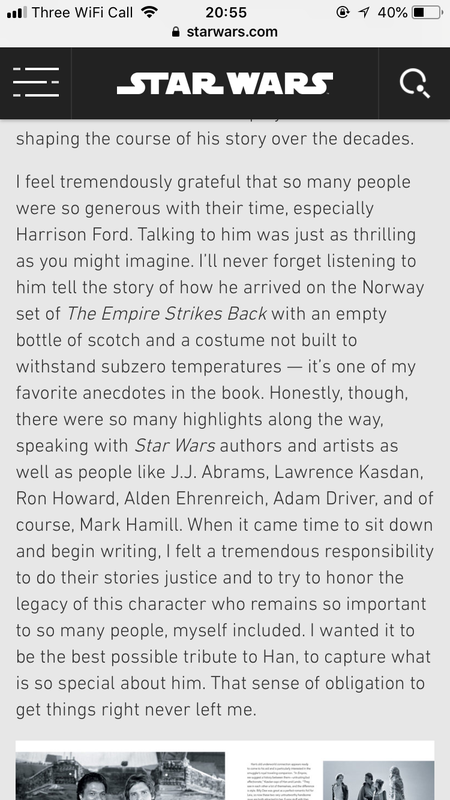 The Sw website has an interview with the author where she talks about meeting with Adam, Harrison and many others when writing this book. @Riri wrote: New Han Solo book coming out in a few months. The Sw website has an interview with the author where she talks about meeting with Adam, Harrison and many others when writing this book. I'm probably reading tea leaves, yet my first thought when I saw the mention of this book on starwars.com - this is to humanize Ben more - how he is like his father; the emphasis of Solo vs Skywalker AND possibly indicating a cameo by Harrison Ford in IX (Lion King/Ghost of the father type scene).